On a cold, blistery morning in January 1869, Joshua Towne, a cashier at the American Express Company, pedaled the first bicycle into Milwaukee. 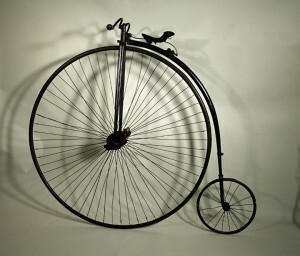 A reporter at the Milwaukee Sentinel announced the machine’s arrival as the dawning of a “new era in Milwaukee.” Known as the velocipede, the wooden machine had two-wheels, a pedal attached to the front shaft, and metal seat for the rider. The velocipede’s popularity began in Europe and quickly spread to the United States in a period observers describe as the “velocipede craze.” In Wisconsin the bicycle’s use traveled quickly during the winter with indoor velocipede rinks opening in Milwaukee, Appleton, and Eau Claire. In spring the streets were so cluttered with bicycles that some rural communities banned them altogether. By 1872 the velocipede’s reputation declined due to their terribly uncomfortable bone-shaking ride. A new high-wheeled bicycle, named after their larger front wheel, began to replace the velocipede as the ride of choice. Due to the expense of owning a bicycle, the sport was limited to the upper middle class and was popularized among young trendy sportsmen. Milwaukee residents could pay $.50 for a one-hour lesson on how to ride at a “bicycle school.” Small bicycle shops opened throughout the city where serious cyclists could purchase the latest model ride, horns, and specialty bicycling clothing. The Andrae family became leading promoters for bicycles in Milwaukee. While Terry participated in races, his brother Henry was an active board member in the Milwaukee Chapter of the League of American Wheelmen. The Wheelmen were an advocacy group for the growing sport of bicycling. Club members urged legislators to support the Better Road Movement. The Milwaukee Chapter hosted large expositions and tournaments that gathered wheelmen from throughout Wisconsin. The club also held numerous social functions and fundraisers during the year, including their popular annual minstrel show that featured Terry as the interlocutor. Julius’ growing fortune, coupled with the bicycling interests of his sons, provided the family with an opportunity to sell bicycles at the electronics store. The Julius Andrea and Sons Bicycle Shop not only sold bicycles, but also became a primary gathering place for Wheelmen and bicycle enthusiasts. By the 1880s the company was manufacturing Andrae bicycles at their factory at 186 Second Street. Briefly the company sold high wheeled bicycles, such as the model in the Historical Society collection, but quickly adopted safety bicycles that were faster and had improved balance. Their models varied for use, including the Light Roadster for touring, the Road Racer, and Track Racer. Local racers preferred the Andrae bicycles. The 1896 Annual Milwaukee Road Race featured an Andrae Bicycle as the top prize valued at $100. The bicycle boom of the 1890s finally made the machines affordable for the average working-class citizen. The Andrae Company was joined in Milwaukee by larger bicycle manufacturing businesses, such as A.D. Meiselbach and the American Bicycle Company. Parts factories in the city made every piece from pedals to spokes, and hired hundreds of workers including young children who inserted the spokes into wheel frames. Bicycle workers moved into the city and formed workingman clubs and unions. The growth of bicycle and bicycle parts manufacturing soon developed into a million dollar industry in Milwaukee. However, the boom was soon followed by a collapse of the oversaturated bicycle market. By 1910 the dream of bicycles becoming the primary transportation of Americans had ended. The Andrae family continued their fortune in electronics, but bicycles were no longer part of their operations, and the wheeled dreams of the family ended. Henry, Terry, and the Wheelmen had won victories in developing improved roadways, and hastily grew the sport in Milwaukee, but were crushed under the road’s new traveler with the sputter and exhaust of the automobile.